Hi everyone, today I’m delighted to welcome my good friend Alex L! Alex and I started our OA collecting journeys together, and he’s someone I turn to regularly for advice and support. As you will see, Alex has a wide but discerning palette, which is reflected in his amazing collection! Hi, I'm an original comic art collector in my 30s. I grew up reading superhero comic books (primarily Marvel) in the ’90s. Having done my rounds with collecting comics, toys, statues and CGCs, I finally settled on OA. As with many other collectors, I feel that there is nothing quite like holding a one-of-a-kind piece in your hands. It is, for me, up there at the pinnacle of exclusive collectibles. Apart from the uniqueness of art, I also chose this hobby due to its significance and relevance to pop culture entertainment. Indeed, comics will always have an important and unique place in Americana. But beyond that, with the rise of the superhero cinematic spectacle over recent decades, I believe that our heroes have come to form a distinctive part of pop culture entertainment (and will continue to do so). The chance to own a tiny part of the heritage and history behind that phenomenon is therefore something that strongly appeals to me. I started off by picking up sketches and commissions at a local convention. In the course of researching for commissions online, I soon learned about the availability of published art, both through dealers and auction houses. Suffice to say, I never looked back! Today, OA is my hobby to the exclusion of all others. The vast majority of my art is bought via online auctions. Nostalgia is, as with many others, my prime motivation for clicking those ‘bid’ buttons. While I have much love for '90s comic books, I would say that this was a period in comic history where art was the pre-eminent consideration and story / script tended to only be supporting or ancillary elements. Nonetheless, that is my nostalgia spot, as is clear from the majority of pieces in my collection. My focus is on published superhero art. From time to time, I do however stray from that and pick up the odd pin-up or commission. While much of my collection relates to ’90s art, I also enjoy ’60s to ’80s art by some of the great classic artists. I would therefore probably be considered an example collector, and I enjoy obtaining examples from a wide range of artists spanning several decades. Some of my favorite artists include Art Adams and John Buscema. As for what I am currently on the lookout for, the list is, unfortunately, almost endless, given my appreciation for art from a wide range of periods. 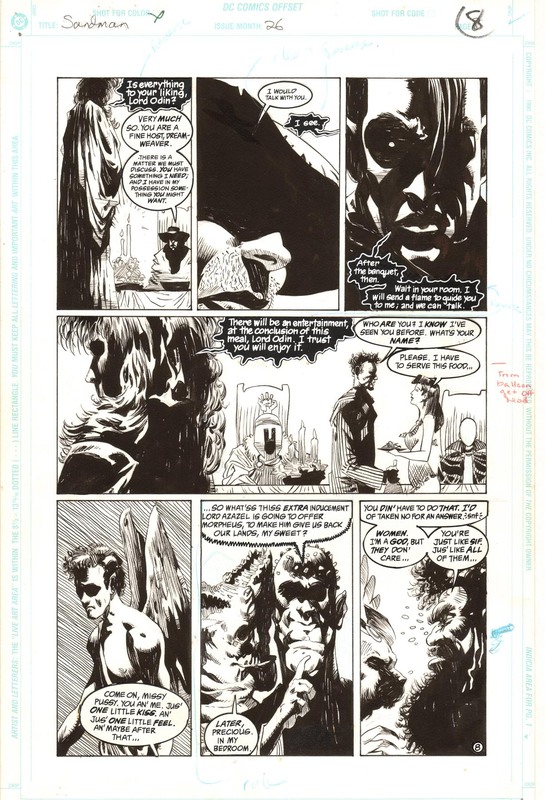 Having waited the longest time for a Sandman example, I was delighted to recently pick up this page by Kelley Jones. Neil Gaiman is probably my favorite writer and I have re-read Sandman many times. To me, the book still holds up today, and will remain an important part of comic book history. While the stable of Sandman creators is certainly impressive, Kelley stands out to me as one of the most memorable artists on the book. This page is from “Season of Mists”, which I consider to be one of the most significant arcs. 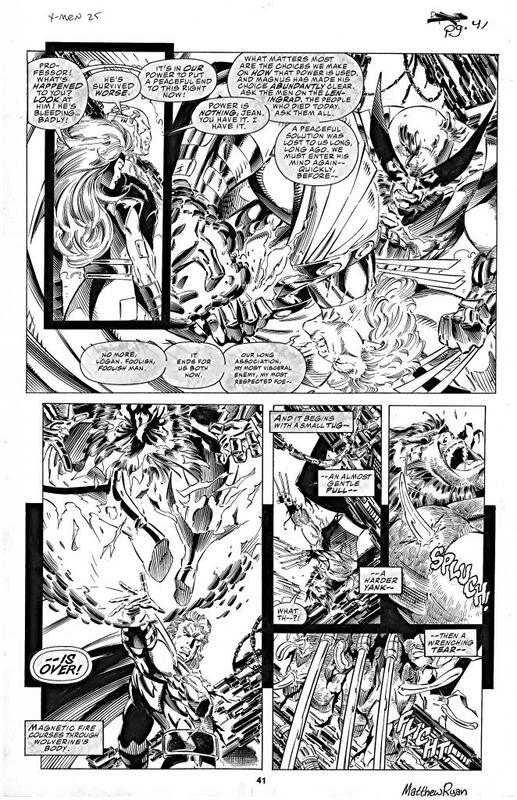 To top it off, the page features a nice cast including Dream, Lucifer, Thor, Odin and Bast. I have great love for Big John's work, having read my dog-eared copy of How to Draw Comics the Marvel Way countless times as a child. John has collaborated with many talented inkers, but my favorite team remains Buscema–Sinnott. I like how Joe's precise, clean lines provide the perfect complement to John's dynamic pencils. 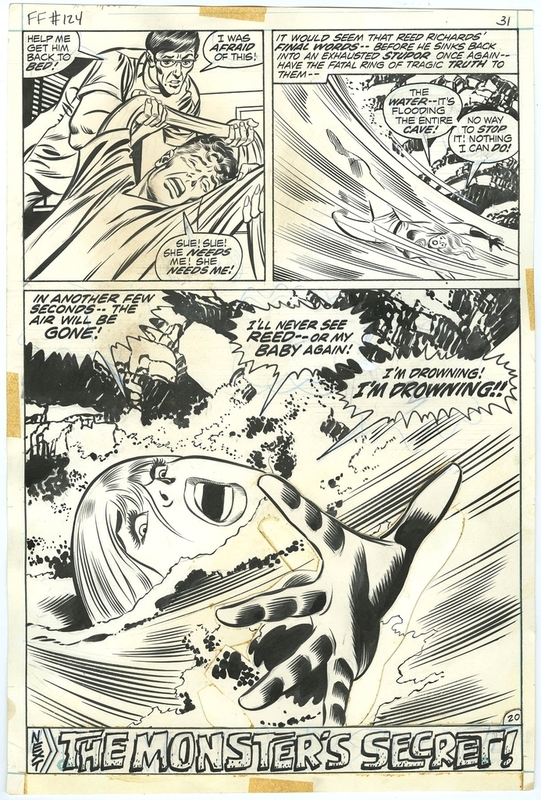 On this Fantastic Four splash page, Sue, having been captured by the Monster from the Lost Lagoon, is now in danger of drowning. Don't ask me why she doesn't just use her force field, but I think the page does well to evoke that classic Marvel feel. “Fatal Attractions” was a popular arc in recent X-Men history and ’90s comics. On this page, Magneto famously begins to extract the Adamantium from Wolverine! As we all know, it was later discovered that Wolvie's bone skeleton was merely laced with the metal. To me, Andy was a more than worthy successor to Jim Lee on the series. I think his dramatic style does well to capture the excruciating pain suffered by poor old Logan, not to mention Magneto at his villainous finest! I find that a fun part of this hobby can be the process of tracking down the history of a piece of art. Being unable to cough up enough for a Byrne Uncanny X-Men page, I picked up this Sentinel by John a few years ago in an auction. The auction house had described it as a pin-up for the Official Handbook of the Marvel Universe. It was pretty cool to later discover the full history of the piece from the learned Ferran Delgado, who was preparing a Byrne feature for Plot magazine. John first drew this as a promotional image for the new arc in Uncanny X-Men featuring the Sentinels after #136 (the “Trauma” issue). This was published in The Comics Journal #57 (circa 1980). The Official Handbook of the Marvel Universe #1 was distributed circa Oct 1982 – Jan 1983. 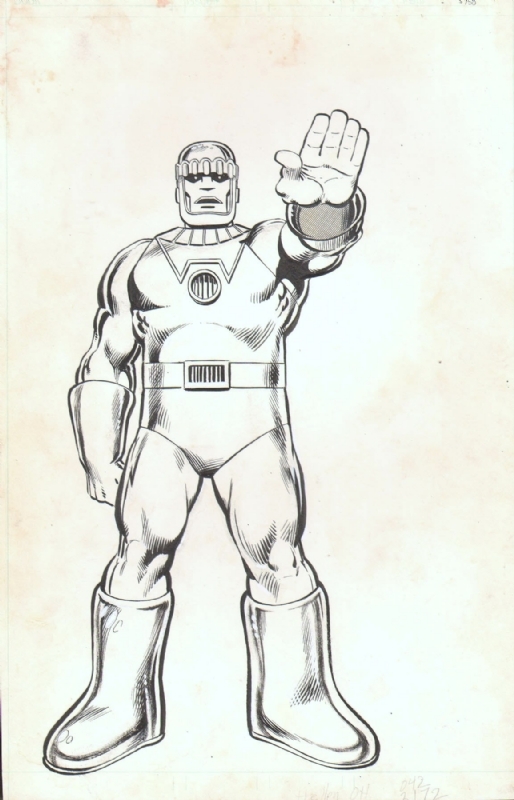 Marvel Comics initially wanted to recycle Byrne's Sentinel drawing and added Rubinstein embellishments. However, when they learned that a new Sentinel model was going to be introduced in Uncanny X-Men #151 and New Mutants #2, they decided to go with a drawing by Larry Hama instead. Much later on, the original Byrne image was published in issues 1 and 8 of Plot magazine. While I would love to get my hands on a Gen 13 or Danger Girl cover, I was very pleased to have picked up this striking Campbell cover. AvX was an entirely forgettable event to me, but I did enjoy JSC's fun, cheesecake style on the covers. 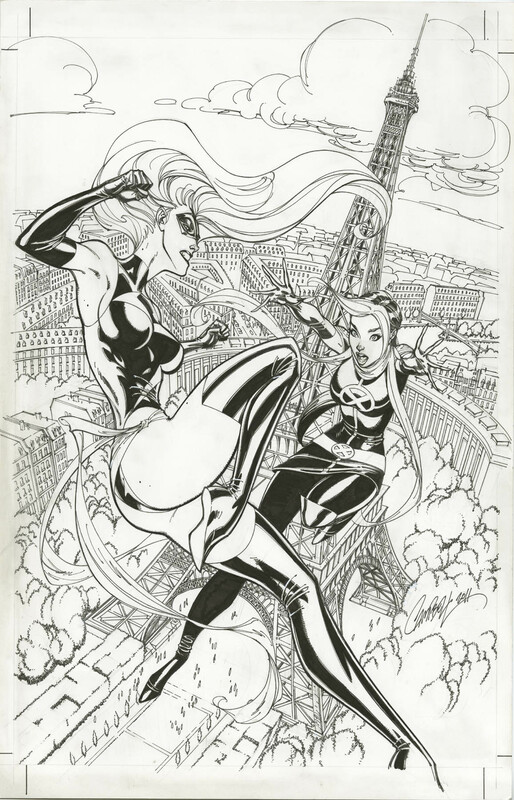 Here, Rogue and Ms Marvel square off (for the umpteenth time) over the Eiffel Tower. Among other things, I think Jeff did really well with the architectural details – who said he could only draw pretty girls! You can view the rest of Alex’s collection here in his CAF gallery. That Buscema page is fantastic! Thanks for sharing. Absolutely LOVE that Art Adams Valkirie cover shot!! This is such a coincidence but I was looking at Alex’s CAF page last night. No idea who he was or anything but I was thinking to myself “this guy has some nice OA pieces”. 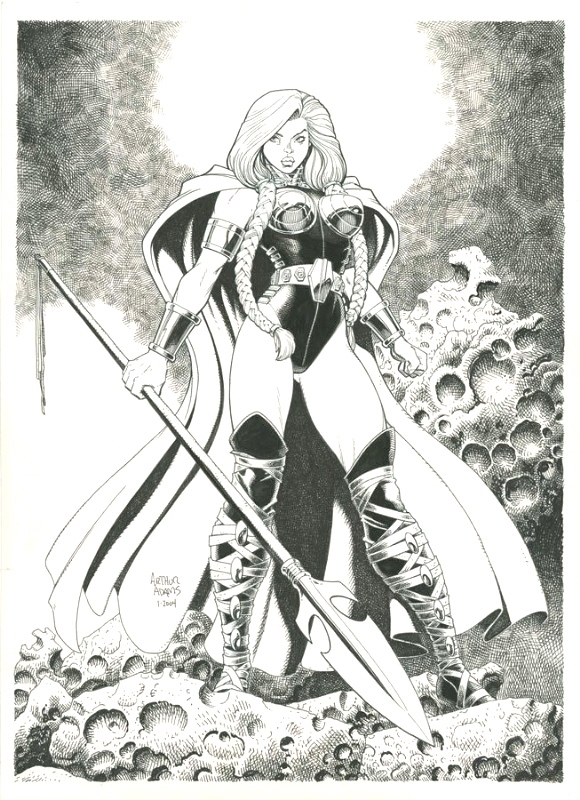 Is Art Adams considered to be an A-list artist? Like when he dies, will his art be something OA collectors would chase? Personally, I love how detailed his art is but would like to know everyone else’s thoughts. Oh yes, Adams is definitely A-list! Art Adams cover is amazing!